HONG KONG, Nov. 8, 2018 /PRNewswire/ -- Cyberport Venture Capital Forum (CVCF), Cyberport's annual tech investment flagship event, kicked off its two-day annual forum today, bringing together investor icons, industry leaders, tech companies and Cyberport start-ups to exchange insights on tech investment trends. Under the theme "Driving New Wave of Tech Investment", the forum explored a wide array of hot topics, including the Digital Silk Road, and tech venture development in Mainland China and the Greater Bay Area. CVCF connects influential investors in the region to start-ups, facilitating investment-matching. 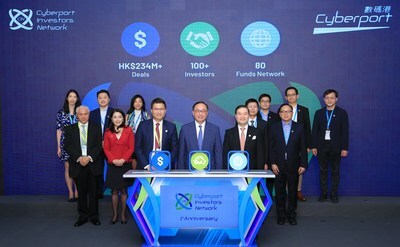 At the opening ceremony, Cyberport celebrated the first anniversary of the Cyberport Investors Network (CIN) and announced the aggregated amount raised for its start-ups surpassed HK$234 million. The two-day Cyberport Venture Capital Forum 2018 started today, gathering investor icons, industry leaders and tech companies to share insights on global tech trends and new opportunities in venture capital. (Front row from left to right) Mr Duncan Chiu, Chairman of Steering Group of Cyberport Investors Network, Mr Nicholas W Yang, Secretary for Innovation and Technology, Dr Lee George Lam, Chairman of Cyberport officiated the forum’s opening ceremony together with other guests. The Hon. Nicholas W Yang, JP, Secretary for Innovation and Technology of the Hong Kong SAR Government, officiated the forum's opening ceremony together with Dr Lee George Lam, Chairman of Cyberport, and Mr Duncan Chiu, Chairman of Steering Group of the Cyberport Investors Network. Mr Nicholas W Yang, Secretary for Innovation and Technology, said that the Cyberport Venture Capital Forum (CVCF) connects investors and industry professionals to start-ups to share insights on technology trends in digitally connected economy, foster investment matching opportunities and generate deal flows, helping local start-ups to scale up. Dr Lee George Lam, Chairman of Cyberport, said, "The global entrepreneurs community is expanding rapidly, establishing new economic models that change the world. Cyberport has been striving to develop a comprehensive ecosystem to support and nurture local start-ups. With the tremendous support from the Government and Cyberport, I believe Hong Kong's start-ups will stand out in the global venture landscape and be able to seize the tremendous development opportunities in the Greater Bay Area and the Belt and Road regions, and become one of the driving forces for economic development in the region." The forum announced the remarkable investment-matching achievements of Cyberport Investors Network. Established in last year's forum, the CIN is an exclusive platform for the Cyberport community to attract more funding and gain the latest investment insights. It also brings about business collaboration opportunities. Mr Duncan Chiu, Chairman of Steering Group of Cyberport Investors Network, noted, "Over the past year, CIN has facilitated 10 investment-matching projects, and raised more than HK$234 million for the start-ups. The CIN comprises 80 funds today, including private equity and venture capital funds, corporate investors, angel investors, family offices, association funds, accelerators, and personal investors, up from 50 in November last year. The rise in membership has enriched the capital's diversity. The CIN walks shoulder to shoulder with start-ups, living out a 'dare to venture' spirit. Besides setting start-ups on the path to success, it also sets off a wave of ventures in the region that helps start-ups make remarkable progress. By bringing in quality funds and facilitating investment-matching projects, the CIN provides the strongest support to local start-ups." As the global entrepreneurs community evolves to the next stage, established start-ups are seeking larger funding rounds. This year's CVCF digs into topics on FinTech, AI/Big Data, Blockchain and Smart City/Living. Cyberport partnered with TechNode, the leading technology media in Mainland China, to debut the world-renowned TechCrunch event in Hong Kong. Dr Jenny Wu, Managing Partner of Baidu Capital, hosted the first CVCF x TechCrunch keynote session, taking an in-depth look into the new funding opportunities brought by the maturing internet ecosystem. On top of Dr Jenny Wu, the forum also invited Mr Jeff Lonsdale, Managing Director of Founders Fund Asia, to analyse the latest global venture trends. Other prominent speakers on the list included representatives from Xiaomi Technology, Wanxiang Blockchain Labs, 500 Startups, OurCrowd, Megvii (Face++) and leading local start-ups such as Cyberport incubatee TNG and FinTech unicorn WeLab. Industry leaders emphasised that the tech investment landscape had undergone fundamental changes over the past few years. Backed by the unique standing and strengths of Hong Kong, start-ups and investors could strive to excel in the global tech venture scene by embracing the opportunities arising from the Digital Silk Road. Mr Jeff Lonsdale shared his insights on regional prospects and how start-ups could better understand the digital tech ecosystem and investment trends to improve their fundraising ability. Mr Yu Du, General Manager of Wanxiang Blockchain Labs, illustrated how technopreneurs could stay ahead of the game and create more value by identifying tech and funding trends. Cyberport is an innovative digital community with over 1,200 technology companies. It is managed by Hong Kong Cyberport Management Company Limited, which is wholly owned by the Hong Kong SAR Government. With the vision to become a main force in developing the digital tech industry as a key economic driver of Hong Kong, Cyberport is committed to nurturing youth, start-ups and entrepreneurs to grow in the digital industry by connecting them to strategic partners and investors, driving collaboration with local and international business partners to create new opportunities, and accelerating digital adoption amongst corporates and SMEs. Cyberport focuses on building five key clusters of digital tech, namely e-sports/digital entertainment, FinTech, AI/big data, smart city/smart living, and blockchain solutions, to foster the development of Hong Kong into a "Smart City". With a committed team of professionals providing all rounded value added services to support our digital community and an array of state-of-the-art tech facilities, Cyberport is the flagship for Hong Kong's digital tech industry.